TheWorkHub works towards developing a community of entrepreneurs, freelancers and employees under one roof. Each works in their area of expertise but also get to share and mingle at informal get-togethers (coffee breaks, lunches) or official TheWorkHub events. Each co-worker naturally chooses the option that suits them best. The varied layout reflects the different professions and crafts that occupy the space. Members of TheWorkHub are linked to one space (Bulle or Vevey) but can go work in the other space if needed. You get a desk in the open space, choosing the spot you like best upon arrival. 350.- / month if you sign up for 12 months, 420.- otherwise. If you prefer stability and for 100.- more, you can choose the option of a dedicated desk. 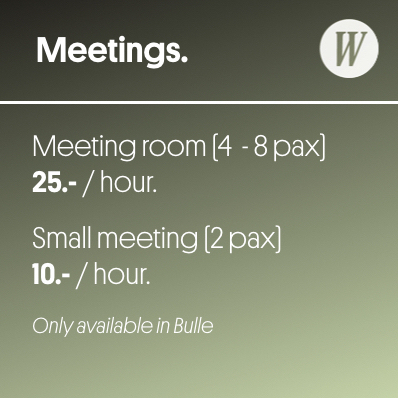 Located within the working space, we offer 2 types of meeting room. For 4 -8 people or for coaching / meeting of 2 people. Booking by the hour. Community member – access to events (reduced rate for paying events) and to the coworking life. In 2019 TheWorkHub Vevey will expand to make a greater number of workplaces available, whether for nomadic use, fixed places or cocoons, as well as integrating a large conference room.